A new customer for us, Peter Timperley, delivered his Laney LC30 II 1×12 combo to the workshop for a general service, but with a special request. Peter wanted to restore the sweet tone that previously existed with this amp, but also wanted to know if we could install a full power/half power switch. The obvious way to implement this mod would be to switch out one pair of the quartet of EL84 power output valves, and correct the impedance mismatch that this introduces by utilising the impedance selector switch on the rear panel. In other words, we need to increase the primary impedance that the EL84’s require from 4000 ohms a-a (anode to anode) for a quartet, to 8000 ohms a-a for a pair. 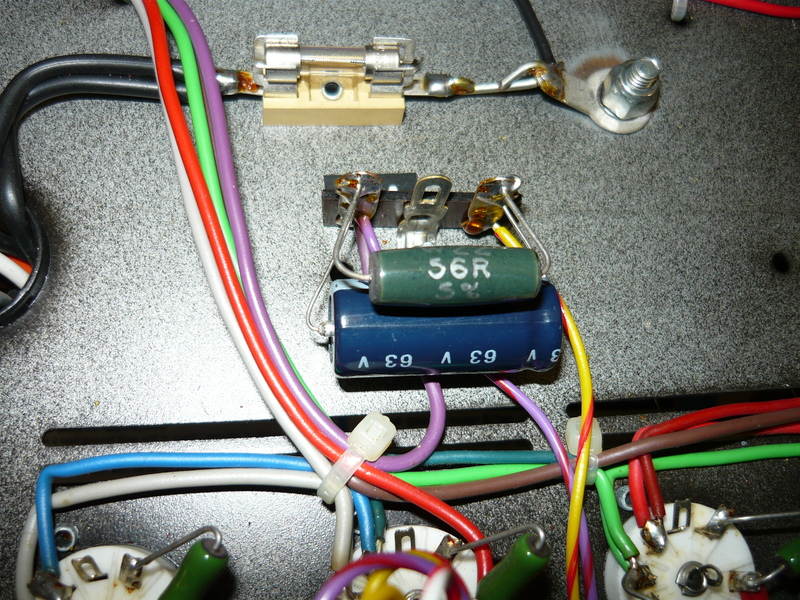 We can achieve that by driving the internal 8 ohm speaker from the 4 ohm connection to the output transformer (see photo #5). 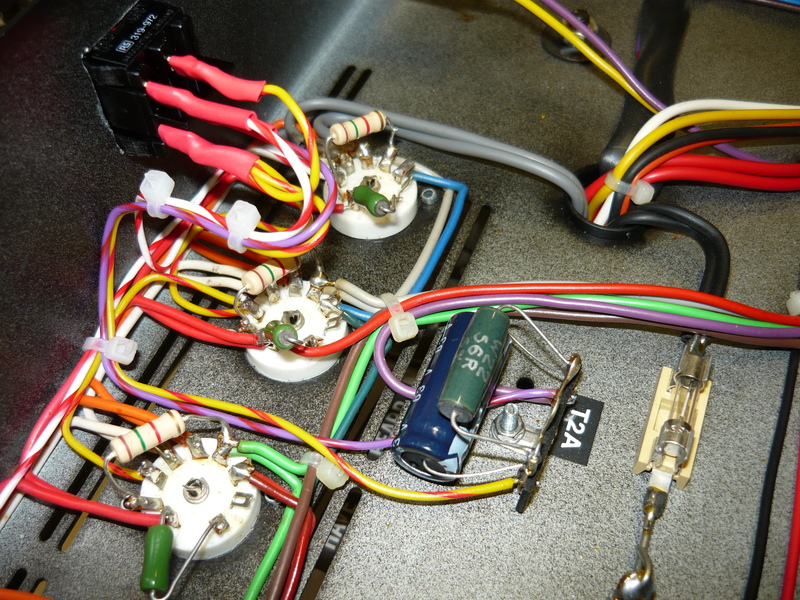 That is not the full story, however, as this amp employs a cathode-bias configuration for the EL84’s, so when we switch to half-power we also need to change the bias circuitry appropriately, otherwise the EL84’s will be quite seriously under-biased, resulting in certain destruction. There is not much depth from the rear of the cab to the rear panel of the amp chassis, so we selected a low profile DPST (double-pole, single-throw) rocker switch to mount on the rear panel. One pole is used to switch out (in this case) the outer pair of EL84’s in low-power mode, leaving the inner pair activated for both scenarios. The second pole is used to switch in an additional cathode-bias resistor (plus cathode bypass capacitor) in series with the existing p.c.b. mounted bias components. By this method, the bias voltage is maintained exactly the same, regardless of mode of operation. Creating a 19 x 22mm hole for the rocker switch on the rear of the chassis really isn’t much fun at all, unless you happen to own a hydraulic hole punch. The cathode pins (pin 3) on the EL84 9-pin sockets were rewired, with the inner & outer pairs now having separate paths to the switch. 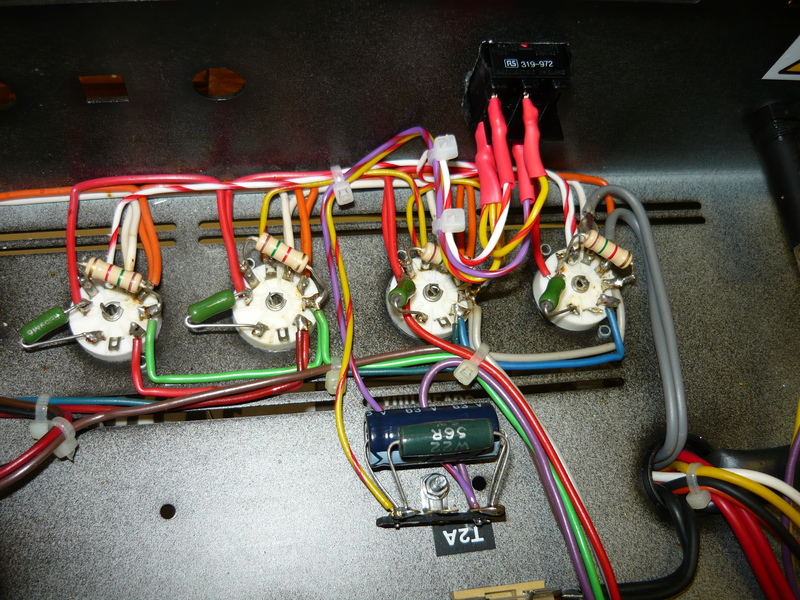 You can see from the photos, the additional cathode-bias components are wired on a small tagstrip installed conveniently near the valve sockets. One end of these components will be wired back to the original cathode bias resistor, on the main board, and from there to ground (earth). We added some Dymo labelling on the rear panel to finish the job. How successful was the mod ? The final power output test resulted in 32 watts/8 ohms full-power, and 17 watts/8 ohms half-power. The tonal quality in half-power mode was in no way inferior to full-power, in fact it might have been a tad sweeter ! Peter contacted us after taking the amp home to confirm he was very pleased with the result. 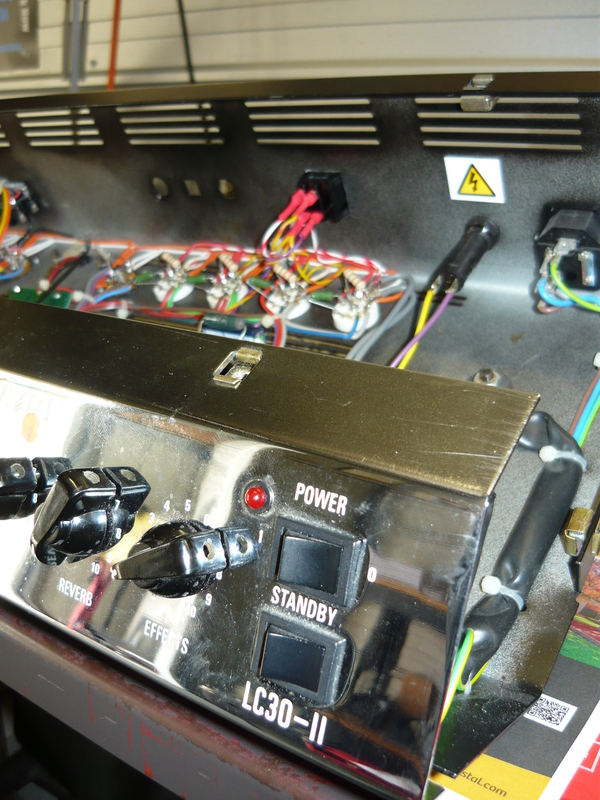 As part of a general service, prior to implementing the mod request, we replaced corroded input & output jacks, cleaned all pots with FaderLube, replaced a dodgy Standby switch, and replaced some high voltage electrolytic capacitors with selected upgraded caps. IR. 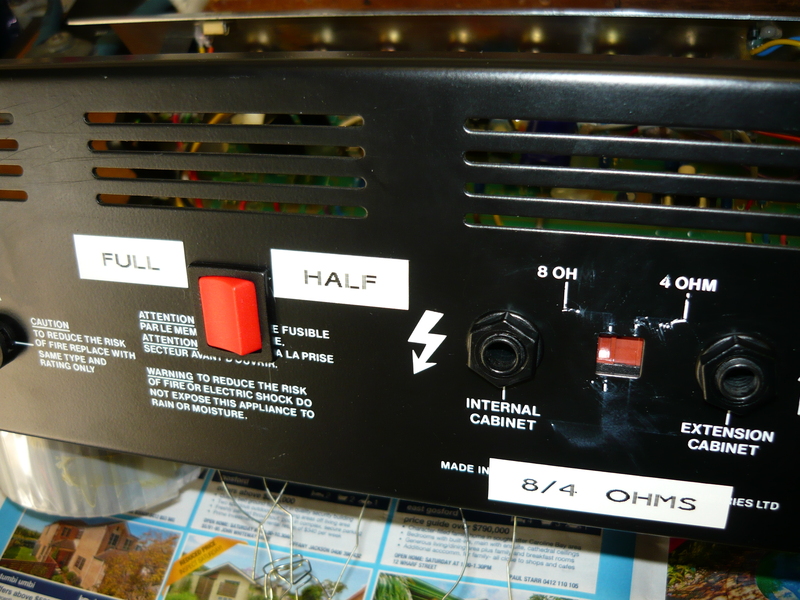 This entry was posted on July 10, 2012 at 11:58 am and is filed under Amp Repair, Amps. You can follow any responses to this entry through the RSS 2.0 feed. You can leave a response, or trackback from your own site. Cheers from Brail! A costumer asked me the same modification, could you please send me the schematics for it? I much appreciate it! Nice one, but if one wants to switch to full power, you need to unplug the speaker jack to the proper socket. Will it harm the amp if you forget to do this? I’ve had a MK1 LC30 for several years and, with some minor mods, I love it. Simply upgrading the speaker and tubes makes a decent amp into a great one – changing the FX loop to serial rather than parallel also made it incredibly more useful. The sticking point for me has always been the headroom – it’s not a problem that many would complain about but the LC30 is REALLY loud, so this mod really appeals. By converting the FX loop I have a “kind-of” master volume control but the reverb really needs to be removed from the signal to be usable…and it still doesn’t quite cut it. My question about this mod is whether a switch with extra poles could be used to override the impedance selector – therefore dropping the wattage and changing the impedance with one switch rather than the somewhat dangerous way of doing it in two places…I’m certain that this would result in a dead amp at some point through a momentary lapse of concentration. Steve, the half-power switch and the impedance selector switch each have different functionality, one is DPST and the other is SPDT, so this suggestion, while it is a valid idea, is not practical with readily available switches. Changing amp impedance and other similar actions should really be carried out with the amp in ‘standby’ mode.